"SAB Simleks" is a pharmacological drug that has a carminative action. The drug is available as a suspension for oral administration. The active substance of the medication is simethicone. "Sub Simplex" is prescribed with increased gas generation (i.e. infant colic in the postoperative period) when preparing the digestive system to ultrasound, radiography, intravenous urography, fibrogastroduodenoscopy. It is used in acute poisoning with products containing surfactants. The drug prevents the formation of gas bubbles in the contents of the intestine and promotes their destruction. Liberated gases are absorbed by the intestinal wall or are excreted, due to peristalsis. The drug does not react with the contents of the digestive tract. "Sub Simplex" is well tolerated by children and effective for infant colic. Take "SAB Simplex" inside during or after meals. Before use, shake the bottle with suspension. To the drug began to flow from the metering device, invert bottle and lightly tap it on the bottom. Newborns and infants let's take 15 drops (0.6 ml) up to 8 times a day. Pre-slurry can be mixed with water, milk and give with a spoon or from a bottle. Children from 1 year to 6 years, give 15 drops (0.6 ml) after a meal or during each meal. If necessary, use the medicine before going to bed. 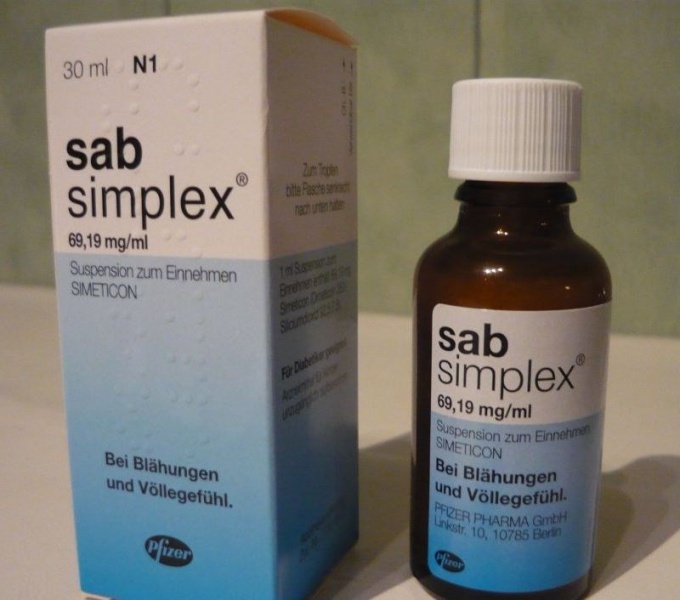 Children from 7 to 15 years let "SAB Simplex" every 4-6 hours 20-30 drops (0.8-1.2 ml). Adults take 30-45 drops 4-6 times a day. If necessary preparation dose can be increased. The duration of medication is determined by your doctor. According to the testimony of the tool can be used for a long time. To prepare the digestive tract to the studies adopt the "SAB Simplex" in the evening, on the eve of the day of the procedure. Dose needs to be 3-6 teaspoon (15-30 ml). To prepare for abdominal ultrasound, the night before, take 3 tsp of the drug and the same amount for 3 hours before the study. In case of poisoning with detergents dose will depend on the severity of the condition. The minimum amount is 1 teaspoon (5 ml). "Sub Simplex" is well tolerated, it causes allergic reactions only rarely. Cases of overdose not recorded, interaction with other medicinal products have not been identified. "Sub Simplex" does not contain carbohydrates, so it can be prescribed to patients with diabetes. In the absence of effect after taking medication, you must consult with your doctor. "Sub Simplex" contraindicated in case of hypersensitivity to components, acute intestinal obstruction, and other obstructive diseases of the digestive system.